I love these towels. Vivid colors. This authentic hotel and spa 3-piece towel set is made from plush, high end Turkish cotton for supreme absorbency and durability. 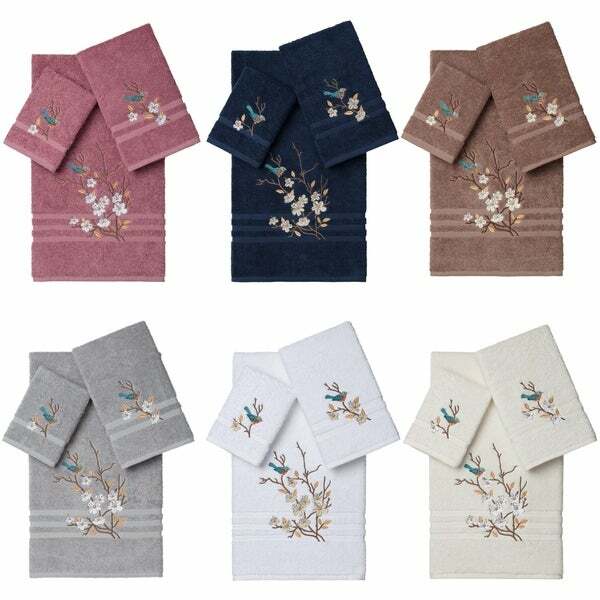 These beautiful towels are embellished with a delicate bluebird perched on a cherry blossom branch in an embroidered design with a dobby woven border to add that special touch to your bathroom. Nice towels, nothing too special. I like that they're not super plush and oversized. Launder well. The gray is a good likeness to the color shown. Would recommend them. The color and pattern are very nice. However, the towels are not pretty thin and not very soft, even after having used softener. VERY PRETTY, BUT THE TOWELS LOSE THEIR COLOR AFTER 3-4 WASHINGS. GREAT FOR DECORATIVE PURPOSES, BUT NOT FOR EVERYDAY USE. very pretty and simple colors Also the design is pretty.